My favorite painter Brian Sanchez has curated the “Never No More” show at the wonderful Vermillion art gallery/bar. Last weekend I stayed over at Brian’s house, he was working on one of the pieces for tonight’s opening reception (Free, 6-10pm) and I was putting together ideas for a new mix. We have been close friends for years now, and we always get hyped off each other’s mediums of expression. While he was slaving away all night painting, I was bumping music for him. Keeping the energy going is one fun challenge of DJ’ing, and it was very special to see Brian work and know that I was helping it along in some way. 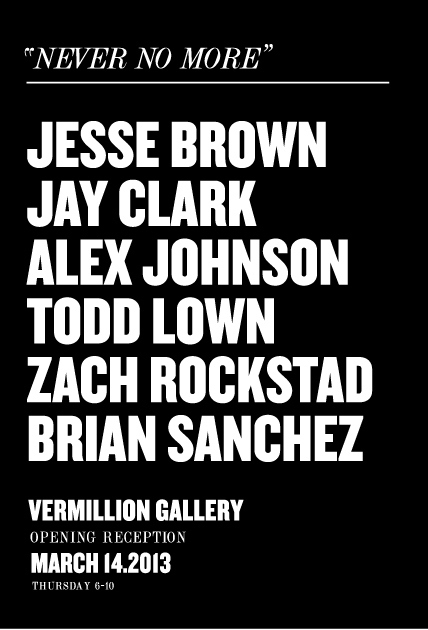 Along with Brian Sanchez, you’ll see art from Jesse Brown, Jay Clark, Alex Johnson, Todd Lown and Zach Rockstad. The show runs through April 6th, 2013. My friend Hollyanne Faber has put together a teaser video with the help of Kyle Steneide which you can check out below. A full video will be presented sometime in the near future.